Mormon art has long had that plastic backlit look about it, but to each his own. Until Jon McNaughton, that is. McNaughton, while claiming no party allegiances, appears to have a pipeline to the past. You know, that special pipeline the tea party has to the ghosts of Founding Fathers past? “The Forgotten Man” has Barack Obama standing on a discarded Constitution while Ronald Reagan, George Washington and Abraham Lincoln gesture at a “forgotten” young man. McNaughton recently withdrew his “One Nation Under God” from the BYU Bookstore—that bastion of liberal expression, which stopped displaying the art. 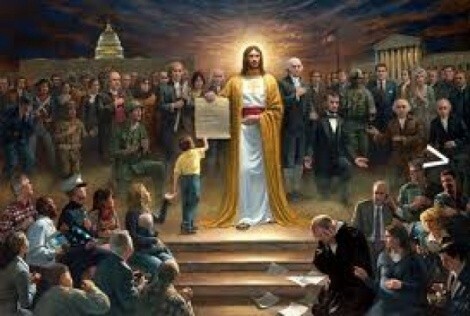 “One Nation” shows Christ holding the Constitution while historical figures weep or rejoice. It’s all about McNaughton’s belief that the Constitution was divinely inspired. Now you’ll have to find him on the Web, not in the bookstore. At the risk of creating another “first woman” story, the Jordan Board of Education nonetheless took the bold step of choosing an outsider as its new superintendent. Well, almost an outsider: Patrice Johnson did her undergraduate work at BYU. But she is news because, frankly, Utah likes to be incestuous when choosing its leaders. So, Jordan instead reached out and chose Johnson from the Clark County School District in Las Vegas. Johnson has taken a tough job at a district filled with what parents call “mistrust and lack of communication.” And not surprisingly, with almost the same number of years in education as former superintendent Barry Newbold, Johnson’s starting salary is $44,000 less. Once again, it looks like it pays to break the law in Utah. EnergySolutions paid an $80,000 fine to the state after burying 23 barrels of waste that was too radioactive, according to records obtained by The Salt Lake Tribune. While $80,000 sounds like a lot to the average citizen, it’s probably a fraction of what the company received for its storage services. But fine aside, the question now is what to do with the waste. The Utah Division of Radiation Control thinks that digging it up would only add to public and worker exposure, and also could cost upwards of $2 million over two years. Well, that’s a no-brainer. But sadly, it’s also a nice little precedent that says rules are made to be broken.